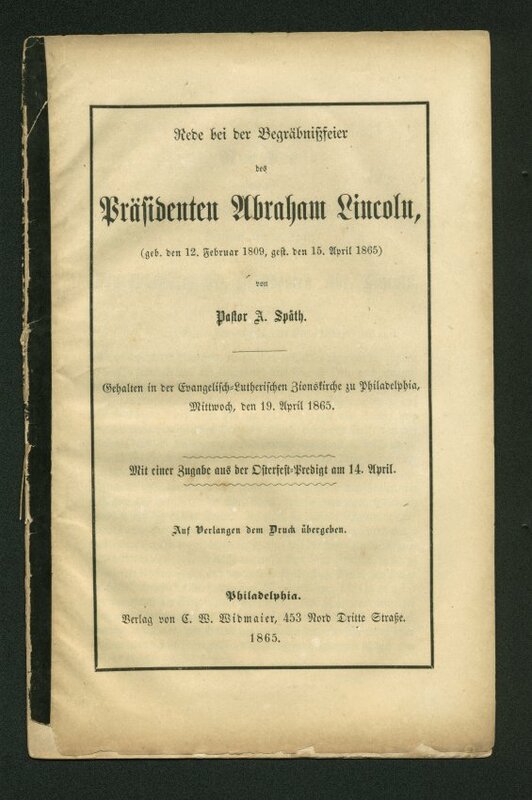 This pamphlet is a transcript of the eulogy given for President Lincoln by Pastor Späth at the Evangelical Lutheran Church in Philadelphia on April 19, 1865. The entire pamphlet is printed in German. Use of this item for research, teaching and private study is permitted with proper citation and attribution, as “Courtesy of The Abraham Lincoln Foundation of The Union League of Philadelphia.” Reproduction of this item for publication, broadcast or commercial use requires written permission. For permission, please contact The Abraham Lincoln Foundation.